I absolutely am in love with my Milky Way Muddy Buddies that I thought it was high time for another candy bar version. Snickers have always been one of my favorite candy bars. Peanuts, caramel, nougat, chocolate…. perfection. I started experimenting and found that snickers actually melt down quite nicely, leaving little chunks of peanuts in the melted caramel, nougat and chocolate. 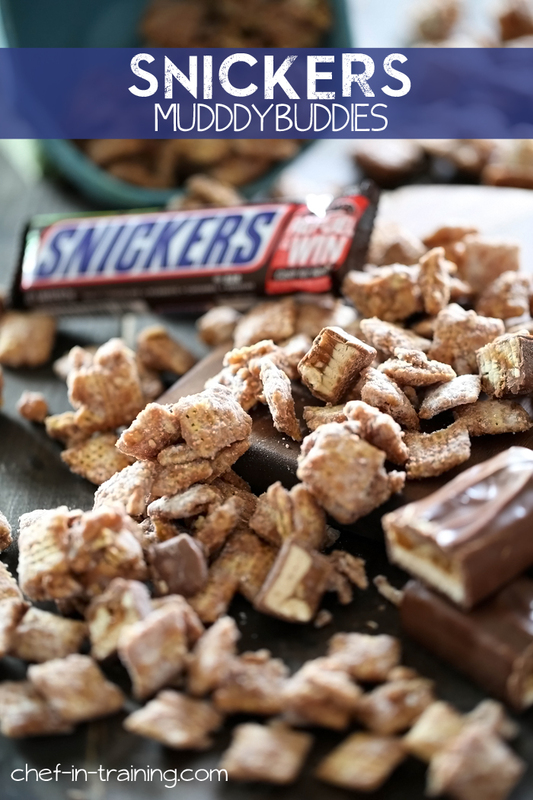 If you like muddy buddies and if you love Snickers, then you are going to LOVE this recipe. So easy to make and will be one of the most addictive snacks you will ever try! This recipe is SO easy and one of the best versions of "muddy buddies" you will ever eat! In a large saucepan, melt butter and Snickers candy bars over LOW heat. Stir constantly. This can easily burn so it is important to keep close eye on it and keep stirring. Once completely melted together, pour over Chex cereal and gently stir and fold it into the cereal to evenly coat. It will be thick, just keep folding it in. It will eventually cover. Next fold in snickers mini bite halves. NOTE: You will have thick clusters. If you don't want them (I LOVE them), use your fingers to pull them apart and sprinkle a little powdered sugar to keep them from sticking together again. Oh yum...yum! I'll be making these this afternoon! The Mini-Bites, cut in half - when do they go in? With the powdered sugar? Just wanted to make sure! Ohmygosh - I love this!! Huge thumbs up to this recipe! Looks so amazing!!! So fun - and delicious!! I am not seeing the recipe for the snickers muddy buddies. Made this tonight and it was fantastic! Even a non snickers eater thought it was delicious. Thanks for the recipe.